Another Week – Another Update! Good heavens! It’s the 1st of May already – the year is racing away on me again! I’ve got a post half written telling you all about the next part of the trip – but life and playing in my art room is getting in the way of my completing it …….. Thank you for all your supportive words and shared stories around my hearing loss. It’s not 100% cured yet but is showing definite signs of improvement – an old, old friend from long, long ago read the last post and got on his white horse and galloped to my rescue. He is a homeopath in Germany these day [if you are there and need one just let me know, I can recommend him thoroughly] His suggested remedy appears to be working, I’m maybe only a foot or so under water now. On the chiropractic side my body has never felt more well oiled and smooth working – I’m very fond of my chiropractor too, even though he does inflict severe pain whilst aligning the bits! I’m painting – I did this one as my response to a Life-Book lesson published two weeks back with a most talented lady named Jenny Lee Wentworth. Her approach quite delighted me and I want to do more work with her in the future. I watched her lesson and a few days later sat down and started work without referring back. I still have to go back and see how far off the mark I was. Pretty far I think – but I liked the freedom it offered, even if I did come back into my own way of doing things really strongly….. This was a lesson in coming to form through layers of colour – no outlining or sketching involved. 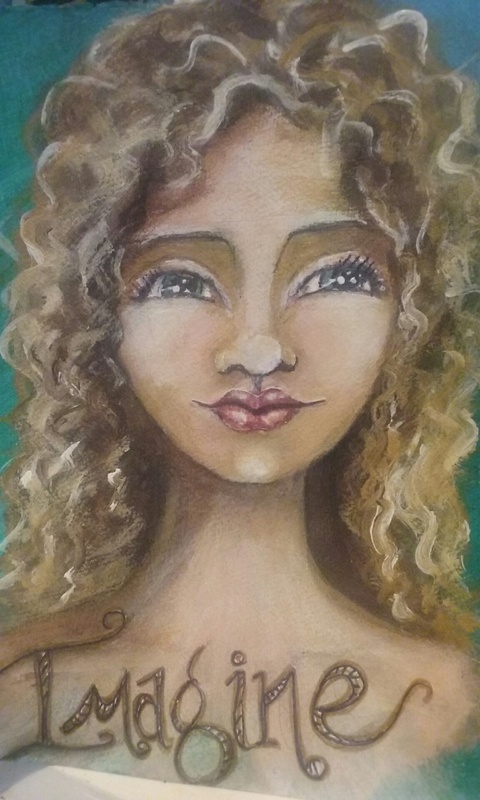 I am wanting to get to a closer resemblance of real people rather than this semi whimsical style – maybe I’m half way in that process…………. As you can see, it’s sitting firmly in its ‘ugly stage’ in this photo. You may be relieved to know she is already looking better, but has a ways to go still. It’s destined for the UK if I like where it gets to by the end – if not it will just get painted over and I’ll start again. In really exciting news, I got suddenly and most surprisingly presented with a new phone by my YD a couple of days ago. It’s a Samsung Android, the one-before-the-very-latest version. Now I’m a modern woman ………. No more getting into scrapes whilst travelling and having no ability to contact my friends without it being a very long convoluted process involving texts being sent half way round the globe and back again – you know the story…….. I can do it myself now. If I ever go anywhere ever again……. It is not the latest super dooper-cooks your breakfast kind of smart phone, but it is an extremely clever and on-to-it kind of smart phone and is probably capable of doing way more than I shall ever require it to do – and it takes really nice photos. Here’s Siddy peering into it – probably ascertaining if it is edible …. 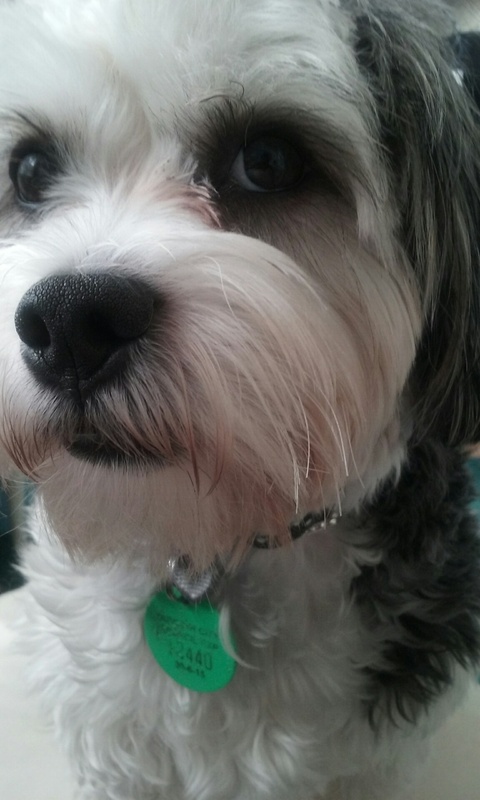 this is his really serious ‘Whatyadoin’ Mumma?’ face. If you are up with the play – and why shouldn’t you be? – you may remember I’m knitting a lovely pinkish lacyish shawl with a KAL [Knit-A-Long] group. I mucked it up a bit when I had to frog a row – then two – and oh dear, three …… I’d decided to gussy it up a bit by adding in a deeper pink for contrast along the edging and was undoing a row. Sigh! Now I am waiting for that other colour to arrive. In the meantime I got all carried away with myself and decided to use the Indian Silk on this pattern too….. This is where that is up to. It’s like knitting with a strand of cotton and will take, I am told reliably by Claire who knows about these things, double the amount of 8 row repeats to get a decent sized wrap out of…… but it will be so pretty and light and airy and just a little bit blingy too ….. I just might be spending the entire winter knitting it! Until then – thanks for coming by today, I love that you did! This entry was posted in Creations From My Craft Room, Daily Life and tagged 'Imagine' mixed media painting, 'Ms Snail' mixed media painting in process, Lace Leaf KAL, Orlando the Marmalade Cat, Siddy the Mitzu Dog, Siddy video by thecontentedcrafter. Bookmark the permalink. Congrats on the new phone! I took my time getting one, as well, and even once I had it, only slowly adapted. I refused getting a single “app” for at least a year, ha ha! It does take marvelous photos of your Siddy and Orlando, though. But with such handsome pets, it’s hard to go wrong. I am in love with the slightly-blingy wrap. The colours are divine, and the lightness seems practically luxurious. A gift for royalty, I imagine. Have continued fun with your phone, you modern woman, you! Such lovely news to hear things are looking up and perking up. And so good to have folks with sure skills who know how to bring back good health. That is an absolute must. And that video of Siddy had me in stitches. Looks like he will tear any dangerous criminal limb from limb if they cross your threshold uninvited. I’m delighted to hear (sorry) there’s been some improvement in your hearing problem. I hope you can chase the problem away completely. Maybe someone can chase it out of the house after flinging it about the room a bit to create new records. Thank you for all your support and encouragement on my blog,it’s much appreciated, How nice to visit you and see your many talents at work. I know you are busy learning how to change the [virtual] world and I am looking forward to observing all that rolls out from your studies. I have a Samsung – not quite up to the minute but only an hour or so behind in terms of advancements. And as we have all learned an hour can make a real difference in the techie world. I was warned off Windows phones a while back when I was flirting with new technology. By the salesman no less. I think that says a lot! The gorgeous yarn is actually being knitted – just to straighten out any needle confusion. But you are completely correct in likening it to a spiders web – it is so delicate and floaty. I shall feel like Isadora Duncan when I wear it! Yeah, we bought our phone via a plan so no “helpful” salesman for us ;). Good to hear you are hearing and feeling better. It looks like your trip provided you with a burst of creativity. 🙂 I keep meaning to tell you my granddaughter loves your note cards. I send her one a month and she saves each to hang in her bedroom. She’s been trying to imitate your style so thank you for inspiring her. I love the photos of Siddy, your phone camera is a good one. I hope for your sake your winter isn’t too bad. I’m so glad you are doing better, Pauline. Where in Germany is your friend. i may have to go there and find him. That’s home to me. A good chiropractor is hard to find. I had a wonderful one in Arizona that treated animals as well. We are going to skip spring and head straight into summer from the looks of things. I love the winter because there is so much I get done inside. Now it’s outside time. It’s taking me a bit of effort to learn the new phone – there are so many things and I’m really not that into becoming dependent on it – but I can see it could be very handy. I haven’t even opened the GPS thing yet! Wouldn’t it be wonderful to be able to travel abroad with our pets – Siddy would love to be tucked up into a plane for 24 hours with a captive audience 😀 . I’ve been hearing so much about Portland recently – it seems to constantly pop up. I wonder why! Just caught up with you on the 1st May thing! 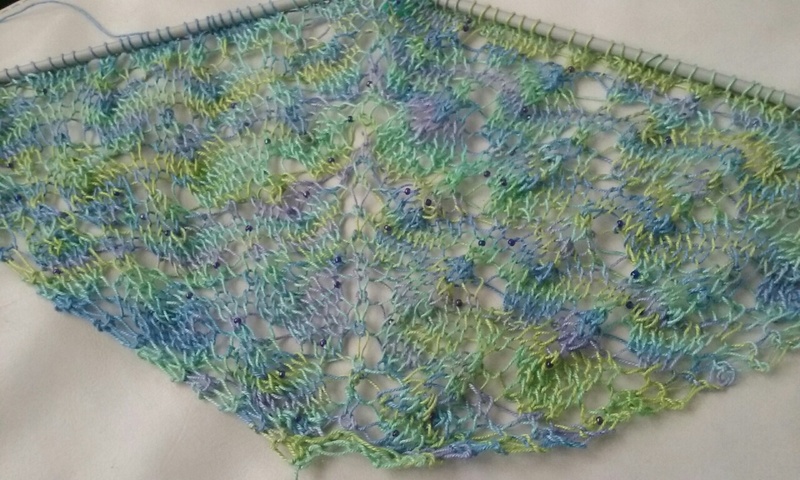 I love the bluey greeny colours in that shawl. I’m a Pisces so anything ethereal and watery gets me going. Lovely! As always Siddy is most wonderful. The pictures of him are absolutely the best and most adorable. I love your paintings. I love your style of painting. The shawl looks great. I love the colors and the beads in the yarn. We are trying to head into Spring here. Shawls and knitted socks are still in play as it hasn’t been that warm. Gardening season is 3 weeks behind where it should be. .
You are three weeks behind and I think we are at least three weeks further into winter than usual! I am most happy that you like my painting style – thank you! That first pic of Siddy is awesome … and the video made me laugh. Has anyone ever told you that you seem to be hogging talent? 😉 Of the paintings, the snail is my favorite. Glad the hearing is improving! Aww Frank! 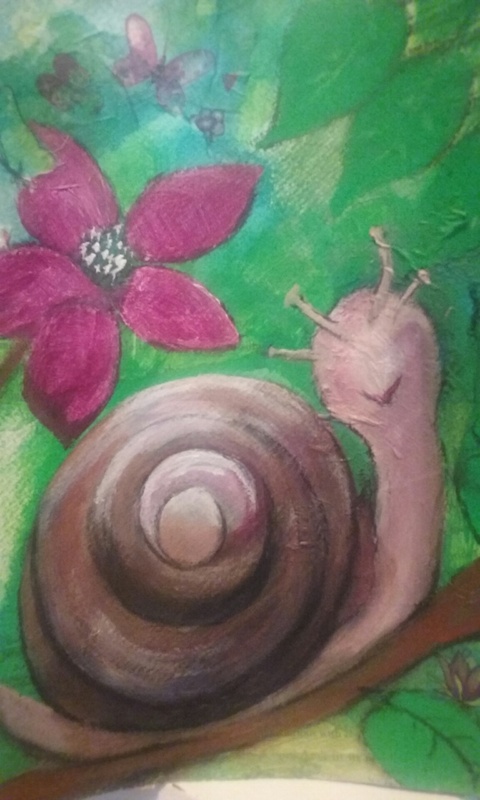 That is a lovely thing to say 🙂 I’m glad you like the snail – she’s become a bit girly now though so you may change your mind – you’ll have to let me know when you see the finished painting. A girly snail. Hmmmmm …. So much good news in this post, Pauline! More fun, though is your new phone (those photos of Siddy are so great!!) and your painting. I already like the Imagine piece and think your direction. Have I told you how cool I think you are? You inspire! I can’t wait til we all come visit you in NZ someday!! You packed a lot into this post! I’m not sure where to begin, in order to respond. You sound your normal, happy self again which I take to mean that the travel fog has worn off and you’re back in your routine. Those sweet pets must be so glad to have you back! And you’re being so creative! Making pretty things should always come before hanging around on the computer! Thank you Kerry – yes I am feeling like myself again and the hearing is a lot better and improving all the time. You are so right about being creative, I always feel better when I’m making something! 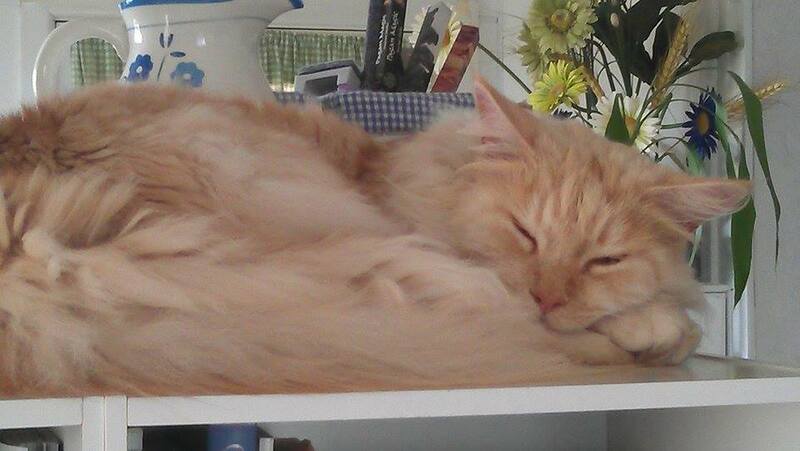 Oh and I forgot to say how relaxed and handsome Orlando is looking…. Well the adorable King Siddy, (I think that should be the correct order of his name 🙂 ), had my Snoopy captivated. Toby, the poodle maltese, likes to throw his toys around too. Unfortunately since the arrival of “Me Too Snoop Dog” he only gets a couple of good chucks in before the fore mentioned puppy pounces on it and claims it as his own. Toby is a good sport and lets him have it. While he’s distracted with the toy he whizzes over to me for a quick pat and a “good boy” before “MTSD” cottons on and then he has to push in for his pat and “good boy”. I’m in such demand you know…. Very clever photography with your new smarty pants phone. Love the eye shot. When the puppies get a clip I always feel sorry that the eyelashes have to go. They soon grow I guess. It is fun to watch them playing isn’t it and to be much in demand for attention too 🙂 I’m using my new phone more as a camera than a phone – I wonder if that will change….. The hearing continues to improve slowly. I can’t believe how fast Siddy has grown up! I love the video, I could watch it over and over. Siddy is a big boy now! He turned a year old on the 4th April and ever since then has been has been all over maturity! 🙂 You might remember one of the first photos of him on the blog was with his friend Mr Fox. They were the same size – now look – and Mr Fox still loses all the battles! You are so talented, wish I could make a shawl! Robbie you make a garden! Way more satisfying, useful, beautiful and able to be enjoyed by many!! Shawl-shmawl! lol-I just burst out laughing when you said he is high maintenance-too funny-he sure is a “pretty boy” tee hee! I call Simon my “needy” kitty for he is constantly asking to be cuddled. He was found in a dumpster eating meat off the bones…I have to put the meat away quickly or he jumps up trying to find bones! He is not high maintenance, but he sure is hariy! Pauline, I believe your snail is smiling at me. It’s the best kind of snail, too, painted on paper instead of eating paper, and basil and other things. I think it’s charming. I do love your new beauty and all the detail in her eyes. I like the light, the reflection if you will. I hope you’ll continue with these courses as they seem to challenge you and keep you inspired. Then we get to see the results! Dear Orlando is the sweetest kitty ever. I’m glad to hear his winter coat is coming it, but sorry to hear that winter is arriving ahead of schedule. Congratulations on your new smart phone. What a lovely gift. You’ll soon wonder how you managed without it and in the meantime YD and ED will worry less. I know as a mum it’s a relief now that both boys have a phone. At almost 15 and 18, they spend more time on activities. It’s a nice way to stay in touch. Does this mean that the lovely pink knitting you worked on during your travels is now completely unraveled? Or frogged as you put it. I wasn’t familiar with that term, but guess it means the unraveled bit of yarn that was once beautiful stitching. On the bright side, you’ll have three options for a warm lap this winter: Orlando, Siddy and your lovely knitting bundle. 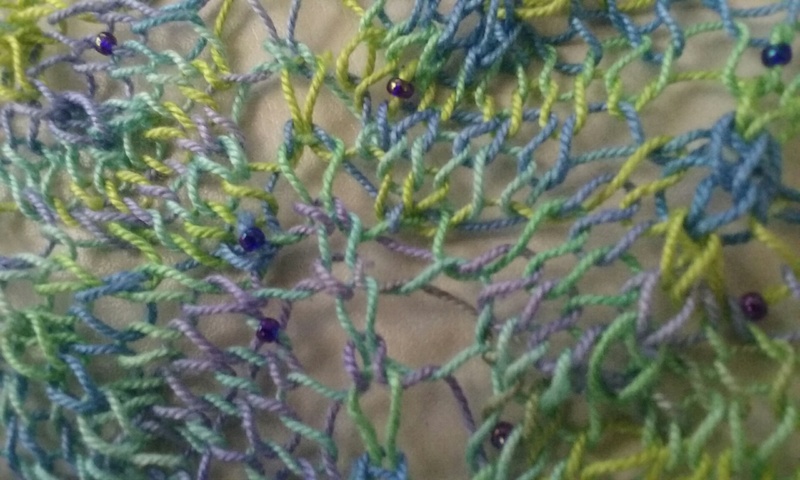 No Alys, it is not completely unraveled – but there is a bit of a mess to tidy up what with all the knittings together and making of stitches, when you undo a row it gets a tad messy. We’ll see how clever I am when the new yarn gets here next week. Wasn’t that such a lovely gift? It came as a complete surprise, but I know she had been wanting me to have one when I visited you – now I can come again and not worry about getting lost. In fact I should deliberately get lost so I can call and tell you where I am! It’s giving me a headache though sorting out how to use it. Touch the wrong thing and all kinds of crazy stuff happens – which I can then not find again when I want to! I can well imagine however the invention of phones has made parenting and tracking down teenagers a little easier. Mine were still on verbal arrangements, notes and land line calls to tell me they were at a friends house when I thought they were due home…. and hours spent sitting around at train stations waiting for them to eventually turn up…………. I used to always have some marking or other school work on hand to do while waiting. Thank you for liking my snail – I agree it is the best place to have them… I made her look friendly to overcome my native dislike of them……. He’s gorgeous. Syd does that too, waits for approval or acknowledgement when he thinks he’s been very clever. Could you hear the fox squealing??? If so, then things are better. I’m glad you’re seeing improvement and the new phone/camera/video tool sounds great. Keep up your painting!!!! Perhaps you should paint every day and work on the shawl every two days 😉 After all, you have all winter! Hi Pauline, I’m glad your hearing is getting better 🙂 Your new paintings are just lovely, Imagine is very serene and I love her hair! I’m really glad your hearing is improving. Your version of Jenny Wentworth’s lesson is fantastic. I love the softness in the hair and the sparkle in the eyes. I look forward to seeing how your snail comes along. 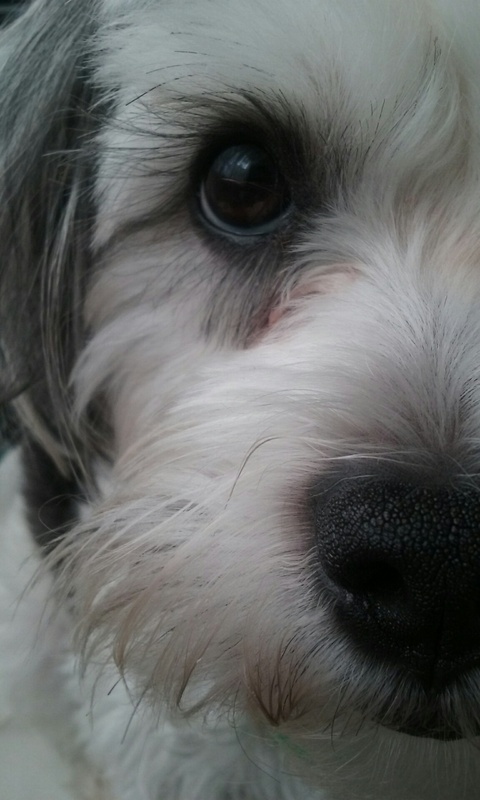 I love my Siddy fix, and his peering into the lens is so funny! Also Orlando is precious, so cute while sleeping. I enjoyed the Magine lesson where you produced a beautiful character, without pencil or lines. Just layering colors and paint strokes is such a unique approach, I would have a hard time doing this, I think. Pauline, I enjoy visits where I get a chance to ‘see your world,’ including the little details of the blues and greens in the woven wrap. All winter, at least you know what will be your project! Thanks for popping in Robin – always lovely to see you – and anyone who appreciates my little fellows is doubly welcome! I am challenged by creating purely from colour, I always come to form very quickly which in this process is a no-no 🙂 I am determined to master it! I accidentally got sidetracked on arts and crafts, but meant to say I am pleased the homeopathic friend from Germany’s suggestions have been helpful in your improvement in hearing, Pauline. My parents always felt choosing natural solutions was best, whenever possible. I have a friend, Jenny, who has been taking medicine for her ringing and little ‘elf’ tapping in her ears. I have been trying to encourage her to try natural remedies. So glad that your hearing is improving. Lovely to see Siddy’s beautiful face… I am so jealous of those eye lashes.